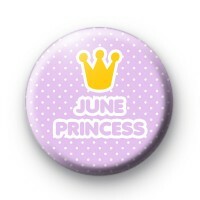 Gorgeous lilac badge with a white polka dot pattern and the the term June Princess written in a bubble style font. Not forgetting the cute gold Princess Crown. If you were born in June & this is your birthday month then you need to wear this badge on your special day. Everyone needs a badge on their birthday and this is a sweet princess themed one.